Tagline: "He was King. She was barely 18. And in their thousand days they played out the most passionate and shocking love story in history!" Some of the finest actors and actresses ever to grace the big screen have taken their turn playing a British monarch, and occasionally a performance comes along that's so good it becomes difficult to separate the historical king or queen from the performer portraying them. Thanks to both Becket and The Lion in Winter, Henry II will, in my mind, always be Peter O'Toole; and Cate Blanchett bears a striking resemblance to Queen Elizabeth I (1998’s Elizabeth and 2007’s Elizabeth: The Golden Age). The list goes on and on; George III? He looked just like Nigel Hawthorne (The Madness of King George), and his descendant George VI was the spitting image of Colin Firth (The King’s Speech). Over the years, a number of thespians have played Henry VIII, one of the most influential monarchs in British history. And who better to have portrayed a larger-than-life individual such as this than the late, great Richard Burton? 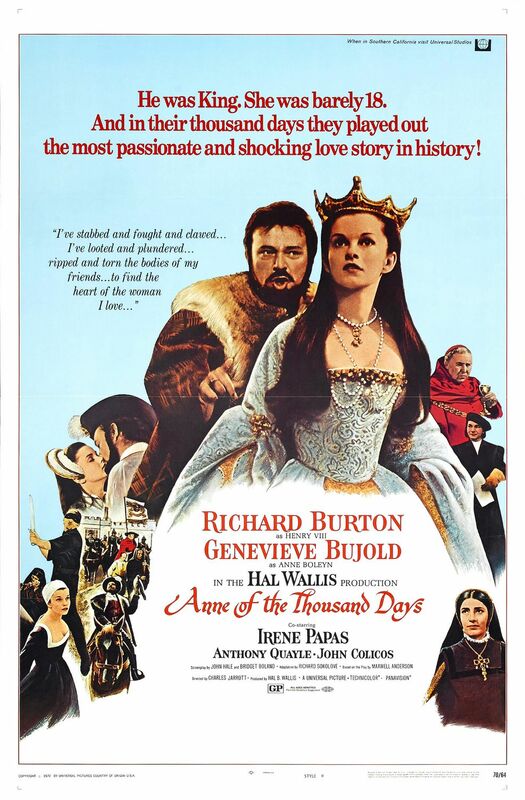 Directed by Charles Jarrott and based on Maxwell Anderson’s stage play of the same name, 1969’s Anne of the Thousand Days follows the torrid and ultimately tragic romance between Britain’s King Henry VIII (Burton) and Anne Boleyn (Genevieve Bujold), a beautiful maiden who shocked the world by becoming a queen. Unhappy that his current Queen, Katherine (Irene Papas), hasn’t given him a male heir, Henry turns his attentions elsewhere, and before long is pursuing the lovely Anne, daughter of Thomas Boleyn (Michael Hordern). Yet despite Henry’s best efforts, Anne refuses to sleep with the King until he agrees to make her his queen. So, with the help of chief advisor Cardinal Wolsey (Anthony Quayle), Henry petitions the Vatican for an annulment, saying his union with Katherine is cursed because she was once the wife of his older brother (who died before their marriage was consummated). To Henry’s annoyance, the Pope, pressured by Katherine’s royal relatives, denies his request. Ignoring the pleas of his own religious community, Henry then breaks away from the Vatican and, as Protector of the newly-formed Church of England, divorces Katherine and marries Anne. But their wedded bliss would not last; Henry’s and Anne’s first child is a girl, Elizabeth, and the second a stillborn son. Without the male heir he so desires, Henry’s eye once again wanders, and in time he seduces one of Anne’s consorts, Jane Seymour (Lesley Paterson). When Anne protests, Henry, aided by his new advisor Thomas Cromwell (John Colicos), has Anne arrested on trumped-up charges of adultery and treason. Found guilty by the court, Anne is sentenced to death, yet to her final hour she pleads not for her life, but for Henry to recognize Elizabeth as his true heir, telling her husband that their daughter will make “a greater queen than any king of yours”. Richard Burton bellows and charms his way through Anne of the Thousand Days, giving us a Henry VIII we simultaneously admire and fear. He occasionally displays humor and warmth (during the scenes in which he’s trying to bed Anne, Henry is almost embarrassingly desperate, yet also seems to develop genuine feelings for the young maiden who, unlike others, temporarily withholds her sexual favors), and when he’s angry, Burton’s Henry is a force to be reckoned with (many of his subordinates, including Sir Thomas More, played by William Squire, experience his wrath first-hand, and pay with their lives). In every scene, Burton has the bearing and charisma of a king, and his passionate portrayal is what keeps the movie flowing (especially during the film’s midsection, which is chock full of political wranglings that some viewers might find dull). Genevieve Bujold is equally excellent as the proud and occasionally spiteful Anne, while Anthony Quayle’s Cardinal Wolsey proves to be the film’s most tragic character (I went from despising his arrogance to truly pitying him as events unfolded). Yet as good as these two (and the rest of the cast) are, nobody can wrestle the spotlight away from Richard Burton (at least not for very long). Others have portrayed Henry VIII with similar gusto: Charles Laughton was brilliant in The Private Life of Henry VIII, as was Robert Shaw in A Man for All Seasons. 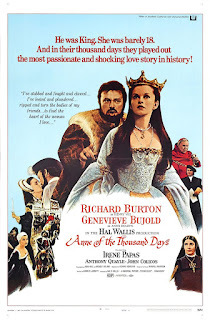 But as far as I’m concerned, Richard Burton is Henry VIII, and Anne of the Thousand Days is the reason why.